This article is about the vegetable. For other uses, see Zucchini (disambiguation). The zucchini (/zuːˈkiːni/, American English) or courgette (/kʊərˈʒɛt/, British English) is a summer squash which can reach nearly 1 metre (100 cm; 39 in) in length, but is usually harvested when still immature at about 15 to 25 cm (6 to 10 in). A zucchini is a thin-skinned cultivar of what in Britain and Ireland is referred to as a marrow. In South Africa, a zucchini is known as a baby marrow. Along with certain other squashes and pumpkins, the zucchini belongs to the species Cucurbita pepo. It can be dark or light green. A related hybrid, the golden zucchini, is a deep yellow or orange color. In a culinary context, the zucchini is treated as a vegetable; it is usually cooked and presented as a savory dish or accompaniment. Botanically, zucchinis are fruits, a type of botanical berry called a "pepo", being the swollen ovary of the zucchini flower. The zucchini, like all squash, has its ancestry in the Americas. However, the varieties of squash typically called "zucchini" were developed in northern Italy in the second half of the 19th century, many generations after the introduction of cucurbits from the Americas in the early 16th century. Harvest-ready, although not yet full-grown, zucchini on plant; the glossy skin is progressively lost after the first week following anthesis. The word zucchini and this culinary variety of C. pepo arose independently and simultaneously in 19th-century Tuscany and northern Italy. Zucca is the Italian word for pumpkin/squash and zucchino/zucchina (zucca + ina = little) are diminutive forms, becoming zucchini/zucchine in the plural. Zucchino, the masculine form (zucchini in the plural), is the first form to be documented in writing. An Italian dictionary called lo Zingarelli 2015, Zanichelli Editore, gives both forms, as does the Devoto-Oli published by Le Monnier, but the Accademia della Crusca, the most important research institution on Italian language, defines zucchino as the preferable form. The Treccani, Istituto dell'Enciclopedia italiana, another linguistic authority, gives zucchina as the main Italian word, and the masculine form as Tuscan dialect. In the United States, Australia, English-speaking Canada, Sweden and Germany, the plant is commonly called a zucchini (/zuːˈkiːni/ ( listen); plural: zucchini or zucchinis), from Italian: zucchina [dzukˈkiːna] (plural: zucchine), diminutive of zucca, "gourd, marrow, pumpkin, squash". The name courgette (French pronunciation: ​[kuʁ.ʒɛt]) is a French loan word, the diminutive of courge ("gourd, marrow") and is commonly used in France, Belgium, and other Francophone areas, as well as in the United Kingdom, Ireland, New Zealand, Scandinavia, the Netherlands, Malaysia, Singapore, and South Africa. In the United Kingdom, Ireland, New Zealand, Malaysia, and Singapore, a fully-grown, matured courgette is referred to as a marrow. Most marrow cultivars sold in the UK are striped. In South Africa, the fruit is typically harvested as a baby vegetable, approximately finger size, and is referred to as "baby marrows". The female flower is a golden blossom on the end of each emergent zucchini. The male flower grows directly on the stem of the zucchini plant in the leaf axils (where leaf petiole meets stem), on a long stalk, and is slightly smaller than the female. Both flowers are edible and are often used to dress a meal or to garnish the cooked fruit. Firm and fresh blossoms that are only slightly open are cooked to be eaten, with pistils removed from female flowers, and stamens removed from male flowers. The stems on the flowers can be retained as a way of giving the cook something to hold onto during cooking, rather than injuring the delicate petals, or they can be removed prior to cooking, or prior to serving. There are a variety of recipes in which the flowers may be deep fried as fritters or tempura (after dipping in a light tempura batter), stuffed, sautéed, baked, or used in soups. Zucchini, like all squash, has its ancestry in the Americas. However, the varieties of green, cylindrical squash harvested immature and typically called "zucchini" were developed in northern Italy, as much as three centuries after the introduction of cucurbits from the Americas. It appears that this occurred in the second half of the 19th century, although the first description of the variety under the name zucchini occurs in a work published in Milan in 1901. Early varieties usually appended the names of nearby cities in their names. The first records of zucchini in the United States date to the early 1920s. It was almost certainly taken to America by Italian immigrants and probably was first cultivated in the United States in California. A 1928 report on vegetables grown in New York State treats 'Zucchini' as one among 60 cultivated varieties of C. pepo. When used for food, zucchini are usually picked when under 20 cm (8 in) in length, when the seeds are still soft and immature. Mature zucchini can be a metre long or more. The larger ones are often fibrous. A zucchini with the flowers attached is a sign of a truly fresh and immature fruit, and it is especially sought after for its sweeter flavor. Unlike cucumber, zucchini is usually served cooked. It can be prepared using a variety of cooking techniques, including steamed, boiled, grilled, stuffed and baked, barbecued, fried, or incorporated in other recipes such as soufflés. Zucchini can also be baked into a bread similar to banana bread or incorporated into a cake mix similar to carrot cake. Its flowers can be eaten stuffed and are a delicacy when deep fried, as tempura. Zucchini has a delicate flavor and requires little more than quick cooking with butter or olive oil, with or without fresh herbs. The skin is left in place. 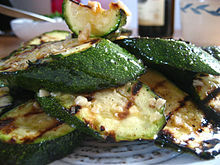 Quick cooking of barely wet zucchini in oil or butter allows the fruit to partially boil and steam, with the juices concentrated in the final moments of frying when the water has gone, prior to serving. Zucchini can also be eaten raw, sliced or shredded, in a cold salad, as well as lightly cooked in hot salads, as in Thai or Vietnamese recipes. Mature (larger sized) zucchini are well suited for cooking in breads. Zucchinis can be cut with a spiralizer to make zucchini noodles for low-carbohydrate recipes. In Bulgaria, zucchini may be fried and then served with a dip, made from yogurt, garlic, and dill. Another popular dish is oven-baked zucchini—sliced or grated—covered with a mixture of eggs, yogurt, flour, and dill. In Egypt, zucchini may be cooked with tomato sauce, garlic, and onions. In France, zucchini is a key ingredient in ratatouille, a stew of summer fruits and vegetables prepared in olive oil and cooked for an extended time over low heat. The dish, originating near present-day Nice, is served as a side dish or on its own at lunch with bread. Zucchini may be stuffed with meat or with other fruits such as tomatoes or bell peppers in a dish called courgette farcie (stuffed zucchini). In Greece, zucchini is usually fried or stewed with other fruits (often green chili peppers and eggplants). It is served as an hors d'œuvre or as a main dish, especially during fasting seasons. Zucchini is also stuffed with minced meat, rice, and herbs and served with avgolemono sauce. In several parts of Greece, the flowers of the plant are stuffed with white cheese, usually feta or mizithra cheese, or with a mixture of rice, herbs, and occasionally minced meat. They are then deep-fried or baked in the oven with tomato sauce. In Italy, zucchini is served in a variety of ways: fried, baked, boiled, or deep fried, alone or in combination with other ingredients. At home and in some restaurants, it is possible to eat the flowers, as well, deep-fried, known as fiori di zucca (cf. Pumpkin flower fritter). In Levantine countries, zucchini is stuffed with minced meat and rice plus herbs and spices. The dish, called محشي (mahshi), is then boiled in tomato based sauce, commonly cooked with ورق دوالي (warak dwali; stuffed grape leaves). Zucchini is also used in various kinds of stew. Stews that have low salinity are favorable in such cooking. In Mexico, the flower (known as flor de calabaza) is often cooked in soups or used as a filling for quesadillas. The fruit is used in stews, soups (i.e. caldo de res, de pollo, or de pescado, mole de olla, etc.) and other preparations. The flower, as well as the fruit, is eaten often throughout Latin America. In Russia, Ukraine and other CIS countries, zucchini usually is coated in flour or semolina and then fried or baked in vegetable oil, served with a sour cream. Another popular recipe is zucchini caviar, the squash spread made from thermically processed zucchini, carrots, onions and tomato paste, produced either homemade or industrially as a vegetable preserves. In Turkey, zucchini is the main ingredient in the popular dish mücver, or "zucchini pancakes", made from shredded zucchini, flour, and eggs, lightly fried in olive oil and eaten with yogurt. They are also often used in kebabs along with various meats. The flowers are also used in a cold dish, where they are stuffed with a rice mix with various spices and nuts and stewed. In 2005, a poll of 2,000 people revealed it to be Britain's 10th favorite culinary vegetable. Stuffed zucchini is found in many cuisines. Typical stuffings in the Middle Eastern family of dolma include rice, onions, tomato, and sometimes meat. 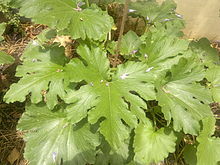 Zucchini plant, Gurgaon, Haryana, North India, India, Asia (2012). Zucchini are low in food energy (approximately 71 kilojoules or 17 kilocalories (or "food calories") per 100 grams (3.5 oz) fresh zucchini) and contain useful amounts of folate (24 μg/100 g), potassium (261 mg/100 g), and provitamin A (200 IU [10 RAE]/100 g). Zucchini can be shaped into noodle-like spirals and used as a low-carbohydrate substitute for pasta or noodles. Members of the plant family Cucurbitaceae, which includes zucchini/marrows, pumpkins and cucumbers, can contain toxins called cucurbitacins. These are chemically classified as steroids; they defend the plants from predators, and have a bitter taste to humans. Cultivated cucurbitaceae are bred for low levels of the toxin and are safe to eat. However, ornamental pumpkins can have high levels of cucurbitacins, and such ornamental plants can cross-fertilize edible cucurbitaceae—any such cross-fertilized seeds used by the gardener for growing food in the following season can therefore potentially produce bitter and toxic fruit. Also, dry weather conditions/irregular watering can stress the plant and favor the production of the toxin. The toxin is not destroyed by cooking. Humans with an impaired sense of taste (particularly among the elderly) should therefore ask a younger person to taste the zucchini for them. In August 2015, a 79-year-old German man and his wife ate a zucchini grown by a neighbor. The couple noted the unusually bitter taste. Shortly afterwards, they were both admitted to Heidenheim hospital, apparently with symptoms of a gastrointestinal infection. The wife, who had eaten a smaller portion, survived, while the man died. Toxicological analysis of the meal confirmed the presence of cucurbitacin. Investigators warned that gardeners should not save their own seeds, as reversion to forms containing more poisonous cucurbitacin might occur. A young zucchini plant grown by a home gardener in the city. Zucchini is very easy to cultivate in temperate climates. As such, it has a reputation among home gardeners for overwhelming production. The part harvested as "zucchini" is the immature fruit, although the flowers, mature fruit, and leaves are eaten, as well. One good way to control overabundance is to harvest the flowers, which are an expensive delicacy in markets because of the difficulty in storing and transporting them. The male flower is borne on the end of a stalk and is longer-lived. While easy to grow, zucchini, like all squash, requires plentiful bees for pollination. In areas of pollinator decline or high pesticide use, such as mosquito-spray districts, gardeners often experience fruit abortion, where the fruit begins to grow, then dries or rots. This is due to an insufficient number of pollen grains delivered to the female flower. It can be corrected by hand pollination or by increasing the bee population. Closely related to zucchini are Lebanese summer squash or kusa (not to be confused with cushaw), but they often are lighter green or even white. Some seed catalogs do not distinguish them. Various varieties of round zucchinis are grown in different countries under different names, such as "Tondo di Piacenza" in Italy and "Ronde de Nice" in France. In the late 1990s, American producers in California cultivated and began marketing round yellow and green zucchini known as "8-ball" squash (the yellow ones are sometimes known as "1-ball" or "gold ball"). 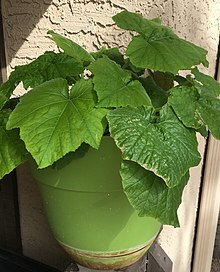 White zucchini (summer squash) is sometimes seen as a mutation and can appear on the same plant as its green counterpart. As of 2014, the world record for the longest zucchini is held by Giovanni Batista Scozzafava of Niagara Falls, Ontario, for a squash measuring 2.52 metres (99 in). ^ Michael VanderBrug, The Timber Press Guide to Vegetable Gardening in the Midwest"
^ Austin, Gareth (23 July 2010). "BBC Dig In blog". Dig In Blog. BBC. Retrieved 11 April 2016. 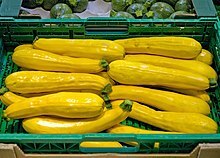 Courgettes are commonly described as marrows harvested young. However, there are some slight horticultural differences between courgettes and marrows. Courgettes tend to be bushy and thin-skinned, whereas marrows tend to trailing and have a thicker skin. ^ "The Gardener's Almanac, entry at "Marrow"". Retrieved 11 April 2016. The general difference between Marrows and Courgettes/Zuchini is; Marrow plants tend to trail out and the fruit skin is quite thick, whereas Courgettes grow as a bush and the skins are quite thin. ^ "Summer Squash". University of Illinois Extension. Retrieved 2013-09-15. ^ "Zucchini". Merriam-Webster. Retrieved 2013-09-15. ^ "Dizionario d'ortografia e di pronunzia". dizionario.rai.it. Rai. Retrieved 24 July 2016. zucchino [+zukkìno] s. m.—anche zucchina [+zukkìna] s. f.—sim. il cogn. Zucchini (z means /ts/ and ʒ means /dz/). ^ Dr. D.G. Hessayon (2009). The Vegetable and Herb Expert. London: Expert Books. ^ "Baby Marrow". AgriLink. Retrieved 2013-09-15. ^ "Panfried chicken with baby marrow and porcini". Woolworths Taste magazine. Retrieved 2011-06-25. ^ Teresa A. Lust and Harry S. Paris, "Italian horticultural and culinary records of summer squash (Cucurbita pepo Cucurbitaceae) and emergence of the zucchini in 19th-century Milan" Annals of Botany 2016, vol. 118, pp53-69. ^ Hedrick, U.P. ; Hall, F.H. ; Hawthorn, L.R. & Berger, Alwin (1928). "Part 4: The cucurbits". The Vegetables of New York, Vol. 1. Albany: J.B. Lyon. ^ O'Neill, Molly (August 15, 1999). "Food; How to Stuff a Wild Zucchini". The New York Times Magazine. Retrieved 2013-09-15. ^ Zucchini Bread Chefs. "Zucchini Bread Recipes". Zucchini Bread Recipe Book. Retrieved 2011-10-19. ^ Kathy Brown (2003). Edible Flowers. Anness Publishing Ltd.
^ Lucas, Brenda. "Now is peak season for the low-cal vitamin-packed zucchini squash". Herald-Dispatch. Retrieved 2013-09-15. ^ Ramanathan, Lavanya (13 August 2014). "Squash blossoms offer petal power". The Washington Post. ^ Wainwright, Martin (23 May 2005). "Onions come top for British palates". The Guardian. London. Retrieved 2011-07-07. ^ "Poisonous courgette warning". Retrieved 2015-10-12. ^ a b "Auf den Geschmack kommt es an". Retrieved 2015-08-24. ^ a b "Mann stirbt an Garten Zucchini". Retrieved 2015-08-24. ^ "Round Summer Squash". Long Island Seed Project. 2007-08-02. ^ Pierce (June 4, 2013). "In season: Summer means squash". Dallas News. Retrieved 2013-09-15. ^ "Longest Zucchini Courgette". Gunness World Records. Retrieved 2014-11-10. ITIS 22365 at the Wayback Machine (archived December 2, 2007), The Integrated Taxonomic Information System, 6 November 2002. Retrieved on 2010-07-19. This page was last edited on 4 April 2019, at 16:46 (UTC).